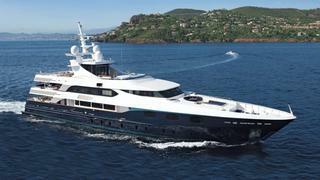 Y.CO tell me they've now taken over the central listing for sale of the 51m motor yacht Alibi. Built by CBI Navi in 2005, Alibi can accommodate 12 guests and has plenty of space for outdoor activities. There is a panoramic open deck area with half moon large sunbathing mattresses and an extendable table for 12 guests and a bar. The sundeck boasts large cushions, a Jacuzzi, a U-shaped settee and another table for 12. Lying in Imperia, Italy, Alibi is asking €15.75 million.